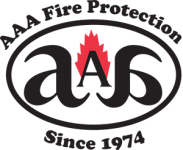 Different business types require unique fire protection services – and that’s where the professionals at AAA Fire Protection excel. Our commitment to quality solutions that will protect your business is legendary, and has been for the last 45 years. We understand the complexities involves in your business and can help define exactly what you need to keep your physical assets and personnel safe. Our high-quality products and services provide you with peace of mind knowing that your business needs are covered not just now, but in the future as well. Ongoing maintenance is critical to ensure effective protection. We work with you to define a schedule for review, repair and replacement that is cost-effective for your business and keeps you protected and up to fire and building codes. Ensuring that clients of all sizes are satisfied and safe is one of the benefits of being a family-owned operation since 1974. Our years of industry knowledge and experience are backed by a caring team of professionals who are state licensed, insured and bonded. Our state-of-the-art servicing equipment helps us maintain the highest possible quality standards with our maintenance and other services.